Salva i burk för eftervård av tatueringar. OBS! Rengör händerna före och efter hantering av salvan. The rich premium Olive Oil, Cocoa Butter and Wheat Germ Oil formula, along with vitamin–e and several herbs provide an occlusive humectant barrier which aids in healing. It won’t clog pores and enhances color of new and old tattoos a like. Tattoo Goo is also good for all kinds’ minor skin irritations such as scrapes, bruises, windburn and sunburn to name a few. 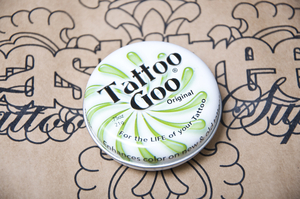 Tattoo Goo has helped heal millions and million of tattoos to date by our count, maybe even more.